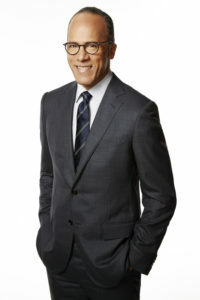 Lester Holt, anchor of NBC Nightly News and Dateline NBC, will host the 2019 Freedom of the Press Awards gala of the Reporters Committee for Freedom of the Press. The gala will be held May 7 at the Ziegfeld Ballroom in New York. This year’s Awards, presented by Comcast-NBCUniversal, will celebrate the achievements of David G. Bradley, Chairman of Atlantic Media; John Carreyrou, Pulitzer-winning investigative reporter at The Wall Street Journal; Andrea Mitchell, chief foreign-affairs correspondent for NBC News and host of MSNBC’s “Andrea Mitchell Reports”; and April Ryan, White House correspondent and Washington bureau chief for American Urban Radio Networks and a political analyst for CNN. The Reporters Committee for Freedom of the Press recognizes journalism and media law leaders whose work demonstrates a deep commitment to the First Amendment and press freedom at its annual Freedom of the Press Awards Dinner. For the second year, the Reporters Committee will also present a Rising Star Award to honor young leaders who are making great strides in the press freedom community and forging new paths in the field of media law. The 2019 Rising Stars are the founders of Chicago’s City Bureau — Harry Backlund, Andrea Hart, Bettina Chang and Darryl Holliday. City Bureau is a nonprofit civic journalism lab that brings journalists and community members together in a collaborative spirit to produce equitable media coverage, encourage civic participation and hold powerful forces to account. The Freedom of the Press Awards dinner brings together the best and brightest in journalism and media law to celebrate press freedom. More than 500 attended the 2018 event and an even larger turnout is anticipated this year, with a goal of raising $1 million to advance press freedom.